This Carriage Print of Oxford by Claude Buckle may not have been published as no prints of it have come to light. The view is looking west along Oxford High Street with Queens college on the right. 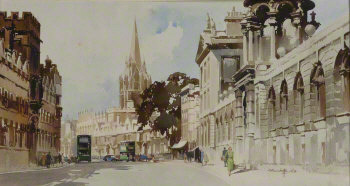 Claude Buckle also painted a famous poster of Oxford showing Brasenose College just up the road. Created in 1949.